Hello everyone! I'm happy to announce that the Android version of the game is finally available to download through Itch.io! I decided to release it this way first in order to get feedback from you guys and make sure the game runs well and has no major issues before going ahead and releasing it on Google Play and iOS. If all goes well, that won't be too far in the future, but in the meantime you guys can enjoy the game and help me out in the process. If you find a bug or some other problem with the game, please let me know in this page's comment section what the issue is, what device you're using, and which version of Android you're running so I can try and diagnose the problem. With that said, I can't guarantee I'll be able to get the game running on all devices, particularly older devices (Keep in mind, despite the game's simplistic graphics, Unity still requires a significant amount of resources to run well). With that said, thank you all for your patience and for any feedback you guys have! Installing the game through your Android device browser is a significantly more complex process than installing it through Google Play, so I figured I'd write this quick guide on how to do it. Click the download button next to the file "BALDI_1.4.1d_Android.apk" on the game's main page. When you click the download button, you will likely see a warning telling you that this kind of file can harm your device, and if you still want to keep it. Tap OK/Yes (Whatever your device says) in order to continue. The file will begin downloading. Once it's finished, one of two things could happen. You will see the file name pop-up on the bottom of your browser's screen, with an option to open it. Tap open to continue. You will not be prompted with an option to open. If this happens, go to your device's Files app (May also be called Downloads, or something similar), and navigate to the downloads folder. Find the Baldi's Basics file (Again, it should be called "BALDI_1.4.1d_Android.apk") and tap it. If a warning telling you your phone is not allowed to install unknown apps through your browser pops up, tap settings to go straight to the settings menu where you can change this option. Turn on the "Allow from this source" switch for your browser. Then go back to the screen you were on before. Make sure that you turn this option back off once you are finished installing the game to ensure your device is secure. Now you should be on a screen prompting you to install Baldi's Basics Classic. Tap install to start the process. Once the app is finished installing, you should be able to tap "Done" to leave the screen, or "Open" to go straight into the game! Enjoy! Again, if you enabled the ability for your browser to install unknown apps during this process, it is highly recommended you go back into settings and disable this option again for your device's security, unless you regularly install apps through your browser. Hopefully this covers most cases. This process could vary a bit from device-to-device, so it may not match up perfectly with what you're seeing, but hopefully it's close enough to where you can fill in the gaps. I think that's really all there is to say, so I hope you all enjoy playing the game on your phones! Hi, I have a Huawei P9 Lite 2017 Android 8.0.0 3 GB ram. When I try 2 install Baldi Basic IT says "App not installed"
Hi. I have a Samsung J3 V and I can't install the new android edition, although my phone is running on a android. 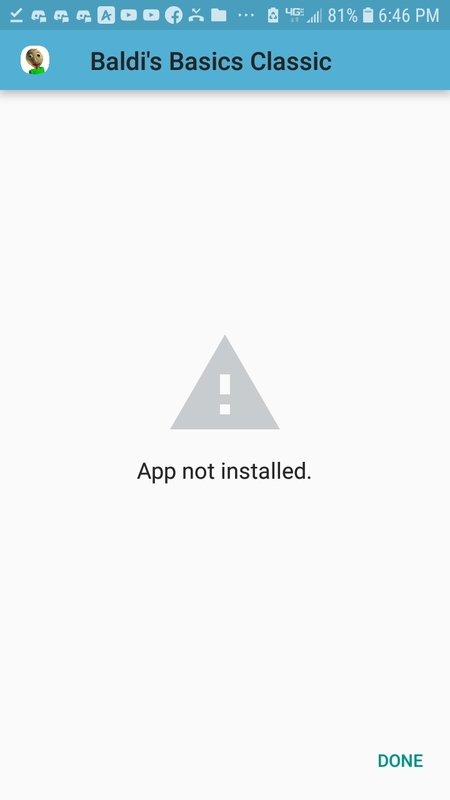 When I click install in the file, all it says is "App not installed", so I could use some help. please change the age of baldi of and there is a bbin(baldis basics in nigtmare). The next update should have a custom school mode and a new character. when will you release the game on iOS? There is a small glitch that I found... Whenever you put in "31718" for the 3rd question and get teleported to the place face room, you can't move around because there is no controls. Other than that, everything works perfectly. i cant find out how i play this game!!!!!!!!!!!! !